Of the many things J.Crew does phenomenally well—costume jewelry, collaborations with heritage brands, and imaginative prints—the coolly casual way the brand’s looks are styled is at the top of the list. We’re always inspired by the effortlessness of the partially tucked-in tees, strategic layering, and cool accessorizing we spot on the brand's models. So, when we heard a rumor that there was an actual formula for executing the catalog’s flawlessly cuffed sleeves, we had to know more. Luckily, its head women’s stylist, Gayle Spannaus, was happy to share all of the details. Follow Spannaus’s step-by-step cuff instructions with the Everyday Chambray Shirt ($78) to perfect the look at home—before you know it, you’ll be on a roll. Start by unbuttoning the entire sleeve. Fold the shirt halfway up your arm, so that the cuff lies across the elbow. Roll the bottom sleeve up the arm once, so it covers cuff’s seam. Roll the bottom of the sleeve up the arm one more time, starting from the bottom inside corner and tug the upper, outside fold so it sticks out. To achieve that scrunched look, push the sleeve up the arm so the cuff sits comfortable right above the elbow. Voila! 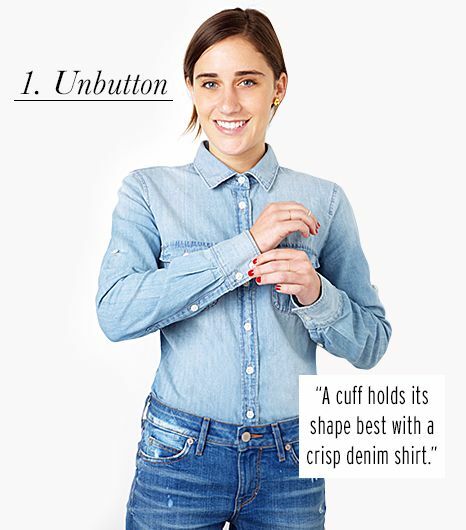 An effortless cuffed sleeve look you can try with all of crisp your button-ups. Create a modern take on the Canadian tux by contrasting this shirt with darker denim. Wear with red bottoms to pull the look together. The definition of a wardrobe staple. Adding this luxurious top to our carts, ASAP. Moodier florals are taking the spotlight this spring. When cuffed right, the pretty ruffle on this shirt's sleeve will still show. This pretty top has us seeing stars. Feel like a pajama top, looks like a work top. The contrast piping makes this shirt stand out. Lean into the Western look. Available in sizes XXS to XS. The prettiest way to do pearls. We love the color combination in this top. Now you know how to cuff your sleeves to perfection. Take it one step further by learning exactly how to style yours.